Like its first season, the Will & Grace reboot’s second season has gotten off to a rocky start. When the show is firing on all cylinders, as it was before it wrapped up before hiatus in the spring, there’s really nothing like it, as the four leads display the chemistry just as intact as it was 20 years ago. But in episodes like tonight, those sublime moments are few and far between, with many more misses than hits. The problem, as so often last season, lies in nonsensical plotting. Where to start: Grace is running for the president of the New York Society Of Interior Designers. Sure. Fine. Then why would she throw this party in the lobby of her building to stir up votes? Yes, she decorated it, but are her neighbors able to vote for the presidency of this design organization? If not, then who did she actually invite to this party? The entire gathering makes little sense, or at least needs some more explanation. 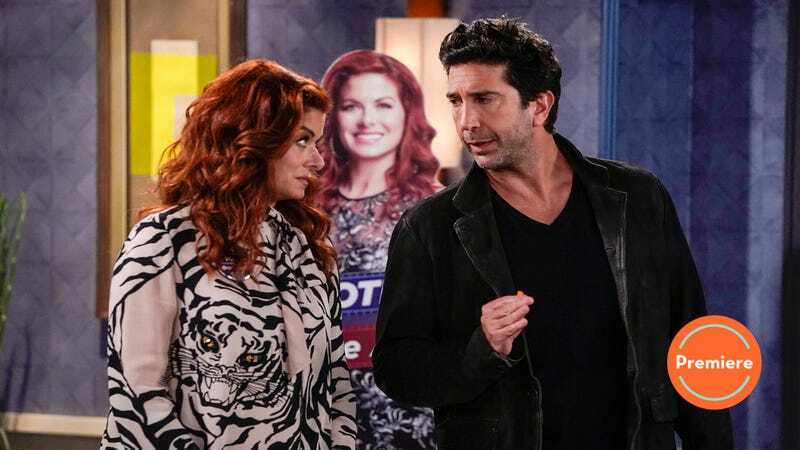 Fortunately, crashing the party is the episode’s near-sole saving grace: David Schwimmer returns to Thursday night Must-See-TV by guest-starring as Noah, the “Westside Curmudgeon.” The Westside Curmudgeon is like if Ratso from Midnight Cowboy’s line “Hey! I’m walking here!” was fleshed out into a whole character that was not Ratso from Midnight Cowboy. While Schwimmer’s character is one-note in his assholery, that seems by design, as the actor seems determined to get as far away from Ross from Friends as possible. He and Debra Messing have a nice chemistry, but once again, the lack of logic of the show is confounding. Grace and Will love Noah, the “Westside Curmudgeon,” for hating and making fun of everything—then he makes fun of Grace online, and instantly everything he does is wrong. (Actually, considering how self-centered Grace is, maybe it’s not that surprising.) She wants Noah to take down the offensive tweet, as if it matters days after it’s been posted. The pair’s sharing of a rice pudding at the end of the episode seems to indicate that this won’t be the last we see of Noah, which might be fun, but we need a bit more from this supposed opposites-attracting couple than Grace prattling on at her most annoying and Noah’s deadpan glares back at her. But Noah and Grace practically soar compared to the B-plot: Karen wants Will to sue a plastic surgeon who is remaking women’s breasts in the shape of her own. It’s like a one line-joke at best that somehow gets stretched into a whole story, which apparently hopes to show that Will and Karen have a bond. After all these years, we know that already. What a waste of Megan Mullally’s usually solid-gold screen time. I guess the point of that plot is also to have Jack get ready for plastic surgery so that he looks good for that Skype session with Estefan. The numbing cream is a bit of a leap (doesn’t Estefan already know what Jack looks like? ), but it can’t be denied that Sean Hayes is a truly gifted physical comedian. His inability to speak through his numbed-up face, and his attempt to eat a banana, was hilarious, almost worth the ridiculous ruse that he would slather on all of that cream when he wasn’t even at the doctor yet, or without knowing for sure when his phone call with Estefan was. But even Jack’s numb flailing doesn’t make up for the “joke” that Estefan’s father just had a stroke, which makes him sound similar to Jack during that Skype call. Playing a situation like that for laughs is the lowest form of humor. So in the end, we have a few inspired moments of physical humor, and a few flashes of chemistry between Grace and her famous new love interest. That’s not much to kick off the next season of the Will & Grace revival, but we’ve been here before. The cast is talented enough, and hopefully the writers can get inspired enough, so that we can look to better, future W&G episodes. Would I hate Grace’s outfit as much as Karen would? : Oh my god yes. Animal print smock, I guess, with the whole face of a tiger and jeweled yees? Did Debra Messing lose a bet or something? Antidote episode: How about “The Young And The Tactless” (season three, episode 21), in which Grace is intrigued by her grungy, grumpy new neighbor (Woody Harrelson). Gee, sounds familiar. Last season ended on a bit of a cliffhanger, with Will and Grace about to become siblings. It seems odd to kick off this season without even a mention of the pair’s betrothed parents. Next week: Alec Baldwin is back as Malcolm, which is not my favorite setup.